Grandmas Birthday, Make it Official! We had the cake, the presents and the decorations but we needed something really special and unusual to help my grandmother celebrate her 95th birthday. An official document proclaiming her birthday, “Martha Hooton” Day, seemed to be just the thing, but we were sure that obtaining a proclamation would be difficult, if not impossible. To our surprise- it wasn’t! Let me walk you through the process. Everyone has someone special in their life that deserves their own official holiday. Proclamations can be issued by mayors, governors, state legislators, city, county or town officials as well as the federal government, to commemorate special events. A proclamation will highlight your family, organization, cause and issues, and potentially get media coverage for your organization and event. It can be a special honor and it’s really fairly simple to get an official proclamation. Give government officials plenty of time to issue the proclamation- I recommend three months. For most proclamations, you will need to send a letter stating your request. Submitting your request early gives you time to correct any problems there might be with the proclamation such as spelling or incorrect dates. I found that the proclamation certificate we received used the exact wording I had used in my letter. They basically just added the words "Whereas or “Therefore” to the first of each paragraph. ("Whereas" sentences state the problem or issue and are followed by a phrase beginning with "Therefore.") So, put some thought into your wording when you write your letter. When writing your request be sure and include the purpose of the proclamation, the date when the proclamation is needed and a brief history of the organization or biography of the person. Be sure to include your name and phone number so you can be contacted if additional information is needed. You can ask for a proclamation for many reasons including the date of your family reunion. You could ask that the day of your reunion be declared, “Wells Family Reunion Day” or “Stewart” Family Reunion Day. Use a proclamation to recognize an ancestor or a special family member. Dignitaries are anxious to grant such requests especially if the family has a long history of service in the community. Some communities will even dedicate a week to your special event, cause or industry. Don’t forget to let your local newspaper know that it is officially your ancestor’s or families’ day. Make it interesting and they may just want to do a write up in the newspaper. 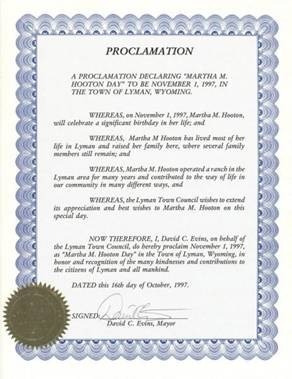 My Grandma’s birthday came and went, the birthday cake was eaten, the crepe paper thrown away, and family and friends returned to their homes, but forever and always, November 1st, 1997, will be “Martha Hooton Day” in Lyman, Wyoming. It’s an official proclamation! 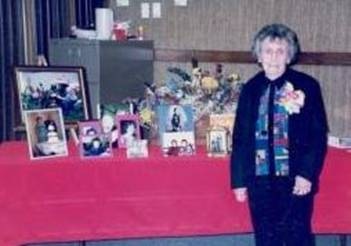 This entry was posted in Uncategorized by Aunt Mo. Bookmark the permalink.